Citation Information: J Clin Invest. 2007;117(4):910-918. https://doi.org/10.1172/JCI30077. Hypoglycemic coma and brain injury are potential complications of insulin therapy. Certain neurons in the hippocampus and cerebral cortex are uniquely vulnerable to hypoglycemic cell death, and oxidative stress is a key event in this cell death process. Here we show that hypoglycemia-induced oxidative stress and neuronal death are attributable primarily to the activation of neuronal NADPH oxidase during glucose reperfusion. Superoxide production and neuronal death were blocked by the NADPH oxidase inhibitor apocynin in both cell culture and in vivo models of insulin-induced hypoglycemia. Superoxide production and neuronal death were also blocked in studies using mice or cultured neurons deficient in the p47phox subunit of NADPH oxidase. Chelation of zinc with calcium disodium EDTA blocked both the assembly of the neuronal NADPH oxidase complex and superoxide production. Inhibition of the hexose monophosphate shunt, which utilizes glucose to regenerate NADPH, also prevented superoxide formation and neuronal death, suggesting a mechanism linking glucose reperfusion to superoxide formation. Moreover, the degree of superoxide production and neuronal death increased with increasing glucose concentrations during the reperfusion period. These results suggest that high blood glucose concentrations following hypoglycemic coma can initiate neuronal death by a mechanism involving extracellular zinc release and activation of neuronal NADPH oxidase. 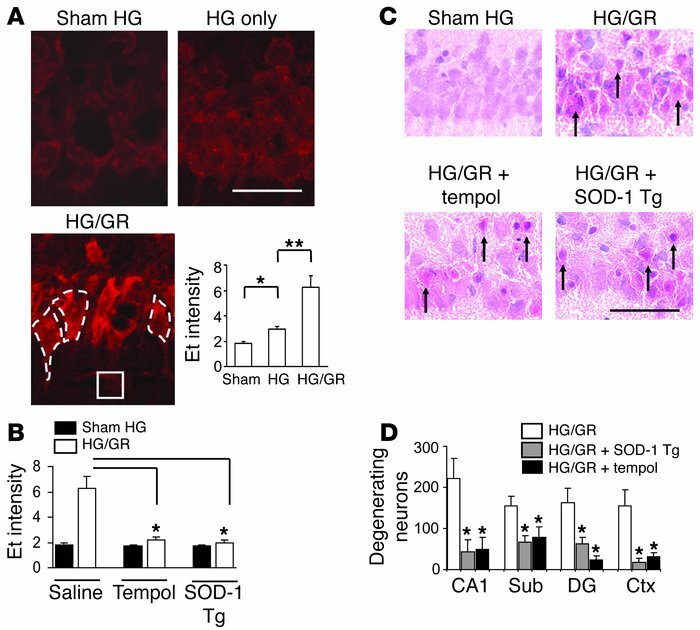 GR induces neuronal superoxide production after HG. (A) Neuronal superoxide production as imaged by Et fluorescence in rat brain hippocampal sections after sham HG (Sham), 60 minutes of HG without GR (HG only), or 30 minutes of HG plus 30 minutes of GR (HG/GR). Et signal intensity is expressed as the ratio of the mean fluorescence in neuronal perikarya (example outlined in white dashed line) to background (stratum radiatum; white square). Scale bar: 100 μm. Data are mean + SEM; n = 4; *P < 0.05; **P < 0.01. (B) Et fluorescence induced by HG/GR was blocked by tempol and by overexpression of SOD-1 (SOD-1 Tg). Data are mean + SEM; n = 3–5; *P < 0.05. (C) Tempol and SOD-1 overexpression also reduced neuronal death after HG/GR. H&E-stained sections of the hippocampal CA1 cell layer prepared 7 days after HG/GR show degenerating neurons with pyknotic, eosinophilic changes (arrows). Scale bar: 100 μm. (D) The number of degenerating neurons was quantified in 4 brain regions: hippocampal CA1, subiculum (Sub), dentate gyrus (DG), and perirhinal cortex (Ctx). Data are mean + SEM; n = 7–10; *P < 0.05 versus HG/GR alone in each region.